Leading Them To The Rock : Are you defending or defensive? 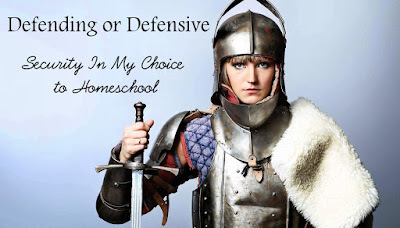 Security in My Choice to Homeschool. Are you defending or defensive? Security in My Choice to Homeschool. There is a difference between 'defending' and 'defensive'. The difference involves an interesting balancing act that can sometimes be based on one's insecurity or pride. Defending is standing up for, or justifying a worthwhile cause. Defensive is anticipating an attack, even before it comes. Many things are very worth defending, but a quick jump to defensiveness can keep you from learning new things or being secure in decisions. During a recent interaction with an old college friend, I was given 'helpful advice' (or what she thought was helpful) about homeschooling, advice that was based on some pretty ignorant assumptions. This particular person does not home school, but has always seem to enjoy giving unsolicited advice. I think her advice stems from either from false pride that she uses as a mask for insecurity. I have learned to tune out or calmly responding to this 'advice' in the past, but when the advice was about homeschooling I went straight into defensive mode. We were also in the company of others and it was not an appropriate time to address the false assumptions she was harboring. Even if we had been alone, I was too mad to reply in a nice way. I was fuming after this conversation because the 'advice' was hurtful. Her apparent judgment had taken me so off guard that I had not had the resources to respond, so my poor husband got to hear me rant in the parking lot of the restaurant for about twenty minutes how frustrated I was that she again letting her insecurity lead her to make ignorant judgments over MY life and MY choices. I spent more time than I would like to admit fretting over this. I went back and forth over the next few days. I planned many conversations, talking to myself in the car and shower, that involved confronting her "in love". My speech to her was going to be along the line of, "Why are MY choices any of YOUR business?! If is isn't a moral issue, then you need to let it go." Looking back, oh how God must have been laughing as I rehearsed a speech for another person that was actually for me. Early one morning when I was writing an email to her on how frustrated I was, God showed me the worthwhile defending of my choice had turned into insecure defensiveness. I was no longer trying to educate, I was trying to justify my own decision. As I wrote my friend on how she had let her insecurity take over, I was typing out words that God wanted me to read. Seeing defensiveness in another is just not pretty, but even uglier when you see it in yourself. I pray God may give me an opening and a time to discuss the false assumptions she has towards homeschooling, but that wasn't lesson of this particular moment. I do care for this woman, and she is currently overwhelmed by life, and her own choices in motherhood. When I stop letting my insecurity steer my feelings, her "advice" really had nothing to do with me. I will continue to educate others about our choice to homeschool ,when the need arises, but my motivation must not be born from my insecurity. After some time and prayer, I see that my need for Earthly justification led to forgetting of WHO called us to homeschool, and WHY we continue to do so. We are justified in that calling by Him because it works for OUR family, not because we think it works for everyone, and hopefully time will bear that out to doubters. And if not, oh well. I am sure I will again need this reminder very soon, but today I am thankful for growth. Wow. God really does direct out paths. I needed to read what you just wrote and did not even know it! Thank you so much for sharing the wisdom, truth and grace that God has given you! It blesses me to know what God has been teaching me helped you also! What an awesome God we serve!